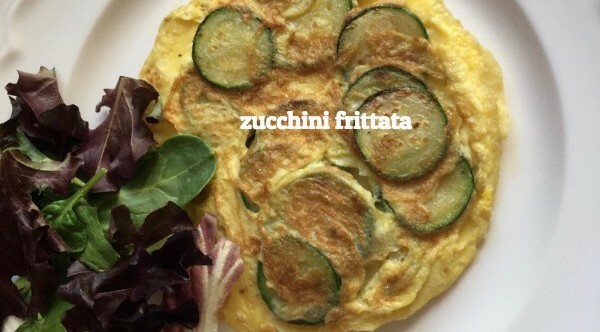 A zucchini frittata makes the perfect lunchtime meal - just add some whole grain bread and a milk and you have a lunch that in not to be missed! Lunch is often neglected in our quest to lose weight as we think that “saving those lunch calories” would make it easier to eat less. In fact the opposite seems to be true - the less we eat during the day, the more we eat at night! There is much talk about the benefits of eating breakfast and dinner. Lunch on the other hand is a meal that is often neglected. It usually is just a quick sandwich, salad or yogurt or simply a “quick bite”. Lunch is actually an important meal for everyone. It provides energy and nutrients to keep the body and brain working efficiently through the afternoon. Increasing our consumption of dietary fiber, fruits, vegetables and oily fish is a healthy goal we should all aspire. Having a healthy lunch each day, either packed from home or chosen at restaurant, is a great way to obtain the essential nutrients we need to get from food. What is a nutritious lunch? The key to a nutritious lunch is variety. Our daily intake of calories and nutrients is best when split over the meals and snacks we eat throughout the day. One way to spread calorie intake over the day is to consume 20% of total calorie intake at breakfast, 30% at lunch, 30% at dinner and 20% for snacks. The calories we consume from drinks is also included in this allowance. Most calories should come from food eaten at meal times rather than from drinks and snacks. What foods and drink should be included in a packed lunch? A healthy, sustaining lunch based around wholegrain, lean proteins, and legumes. Plus the all important fruits and vegetables. Water, milk and milk alternatives make excellent lunchtime beverages. What happens if you skip lunch? Skipping lunch may lead to intense feelings of hunger especially if breakfast was not adequate. This can leave you feeling lethargic and “testy” and cause deterioration in your performance at work. Another risk is that If you go too long without eating, you are likely to eat too much at the next opportunity. Skipping lunch will catch up with you and may make it harder for you to regulate your eating and weight. Take at least half an hour to eat lunch in a calm and restful environment with other people if possible. This will help you to digest the food and drink consumed and ready to face the afternoon with renewed energy! The lunch menu listed - California Vegetable Pizza - I ordered it as - No Cheese California Vegetable Pizza, with a side of Spinach-Quinoa Salad, dressing on the side. I enjoyed a great 3 hour lunch with my dear friend Sarah at California Pizza Kitchen - MarketStreet Lynnfield, this week. Little Big Shift: to reduce risk factors. Risk factors are things in your life that increase your probability of getting a disease. Making small daily shifts in food choices can help reset and decrease risk factors. The most recent Dietary Guidelines for Americans emphasize building a healthy eating pattern across the lifespan. Eating patterns can be described as the combination of foods and beverages that make up the food you eat over time. Think of a food choice as an opportunity to move toward a healthier way of eating to reduce risk factors. Consistent small shifts in food choices - over the course of a week, a day, or even a meal - can make a big difference in your risk factor for developing a disease. Join Delicious Simplicity Lifestyle Plan, an easy and practical plan everyone can follow. We all want to: Be Healthy, Get Healthy, Stay Healthy!